Luxurious sleep, wake later, in a dreamy, pleasant fog of good rest. And welcome guests, my dear friend, up early. We walk together to Longboat Pass Bridge, and it’s a lovely late morning, and I am noticing very little because we are lost in deep conversation. When I first arrived on the Gulf I had a two hour phone conversation with her from this very beach, catching up. And now, we are walking and talking in person, the way old friends do, as if in one, long, continuous conversation from the first meeting. Here is a friend who knows me to the core; and I know her. So, when she asks what I’m writing and working on, she knows the unconscious influences, knows the origin stories, knows, the secrets and conflicts. We haven’t known each other from childhood; but in a sense, we have, because we were in such an intimate and deep training group for five years together. We trained in psychodrama long weekends, year after year, playing in surplus reality, acting out dreams, goals, memories, conflicts, fantasies, old hurts, transformations, playing the roles of all the significant others in each others lives. Playing. Sometimes, often like children. Gleefully, spontaneously, raucously, creatively. Comforting each other. Inspiring each other. Oh, my later today, her sons with her, and we take them, on our kayak trip - Frank’s and my third. The sky a sheet of blue, the air warm, we take them on the journey through the bay to the lagoon to the picnic on beer can island, and oh! the dolphins! A pair of playful, gleeful magnificent silver beauties, surrounding our kayaks, swimming under and around and beside us, dipping and breaching! So close beside me, what a wonderful and strange feeling, to know the big beauty, to feel her swimming beneath me! What I felt was the marvelous sense of trust, shared trust. Yes, it was the kind of energy we gave and received in psychodrama: opening our psyches, letting each other into the shadow and the light of our personal histories. Trust and curiosity. I felt trusted and trusting, that these silver creatures, so strong and forceful, so spontaneous and powerful, would be under and around and next to me, and wouldn’t hurt me, or be afraid of being hurt. So many motor boats out there around us in the bay, and yet, in a kayak, we were on the skin of the bay, and the dolphins danced under our skin. It was a wholly joyful and gleeful trip, the boys in their own kayaks, these old, dear friends, their youthful exuberance; and me, getting to be playful and young, singing and imagining and being a pal, and guiding them onward with excitement for this journey. On Beer Can Island, this strange blown tree place, like an enchanted island; we swam in the surf, the current strong, the water cool and frisked up and foamy. Everywhere, the shorebirds, the cormorants and gulls, the pelicans and ibis, above and around, calling and fishing. The boys climbed the broken branches by the sea. We made a kind of family, happily shipwrecked. This work my friend and I did with each other, with our group, with our clients, with each other, how it has fed our mothering, strengthened and guided us. Thank you, J.L. Moreno, for inventing psychodrama. Thank you Nina Garcia, for being an exquisite trainer. 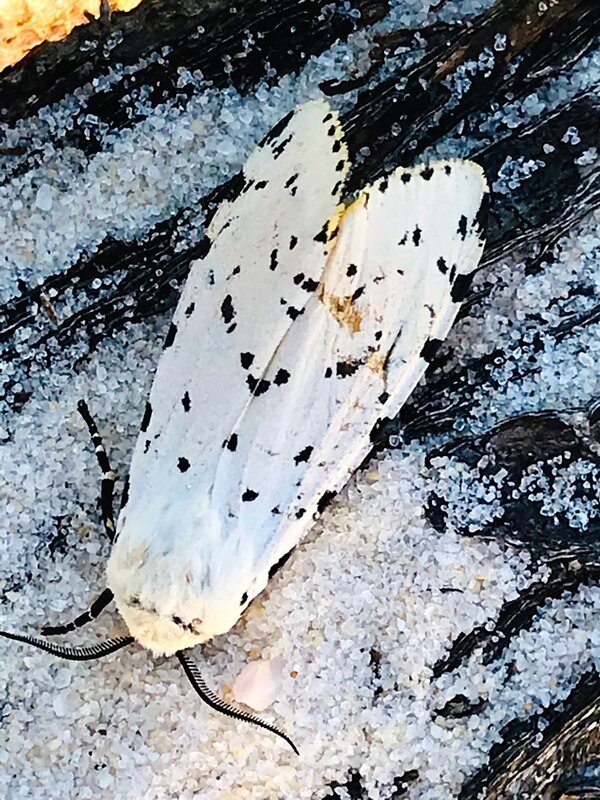 On our walk this morning, the one thing I truly noticed was this salt marsh moth. It was in the sand, upside down, kicking its legs, trying to right itself. I stopped and turned it over gently, and accidentally buried it in sand. Quickly, I scooped it up and set it on this broken branch. Later, after our walk, I learned its name.